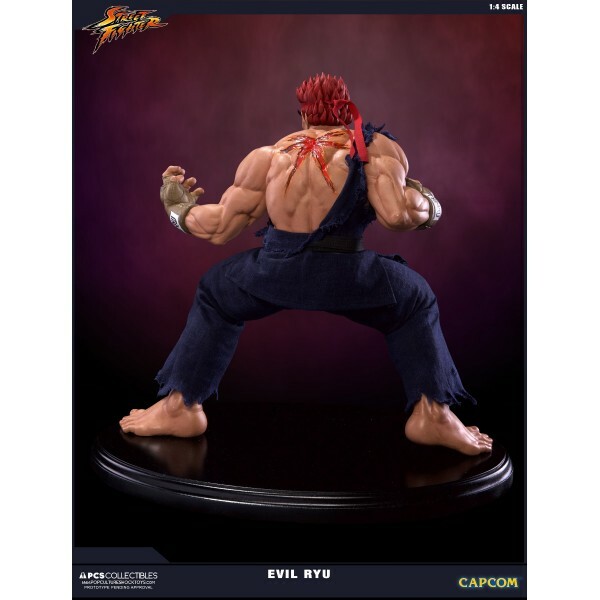 These are words you’d use to define Akuma or M.Bison, not Ryu. Never, ever Ryu. 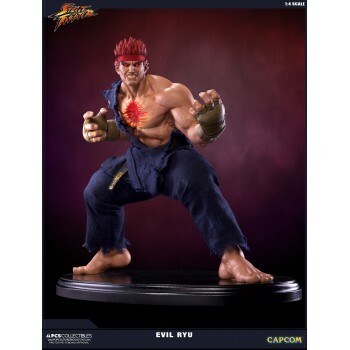 But this is not Ryu. This is your worst nightmare. The Satsui no Hado has long been a cautionary tale in the Street Fighter franchise, a destructive form of Ki that exploits the baser aspects of humanity, corrupting even the purest of souls. Goutetsu taught it to his student Akuma, who embraced it, and Gouken, who recognized it’s risk, refusing to train his own disciples. The more we were warned about it, the more we speculated on what would happen if a character as strong as Ryu forsook his education and let the Satsui consume him. 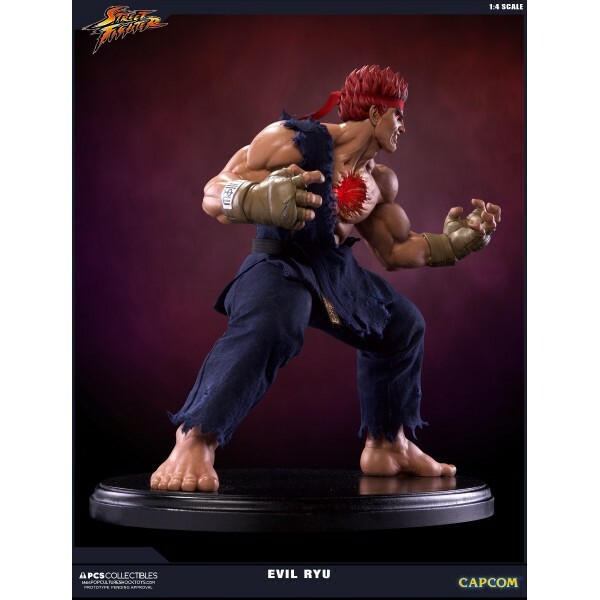 Evil Ryu is our answer, Ryu turned inside out, the surge of murderous intent awakened. He can no longer resist the evil energy within, plunging deeper into darkness with every victory. 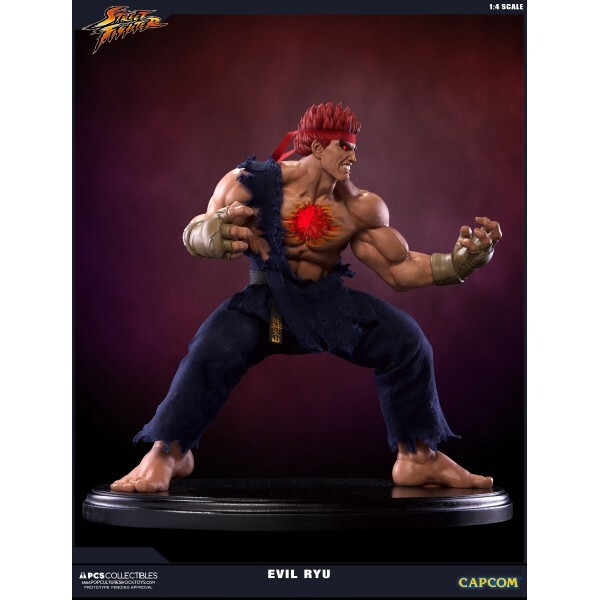 Purged of all traces of honor and decency, this is a Ryu with a blood thirst and ritualistic belligerence bordering on a feral barbarism. 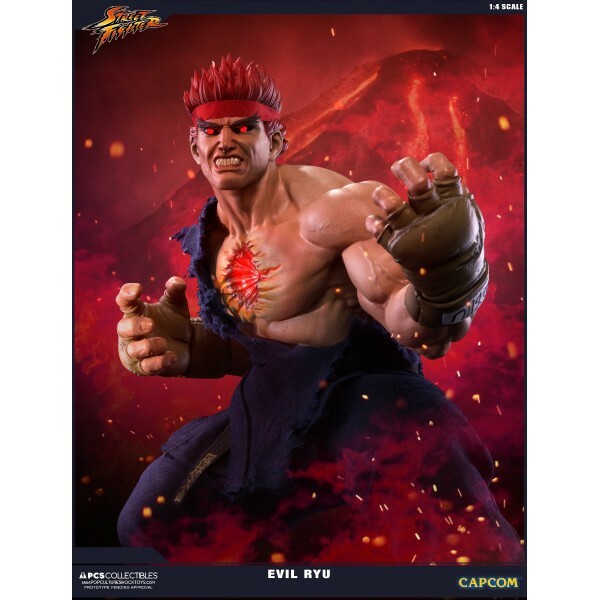 Assuming this anger has made him mindless would be your last mistake, however, as Dark Ryu is perhaps the most calculating and dangerous character in the game. 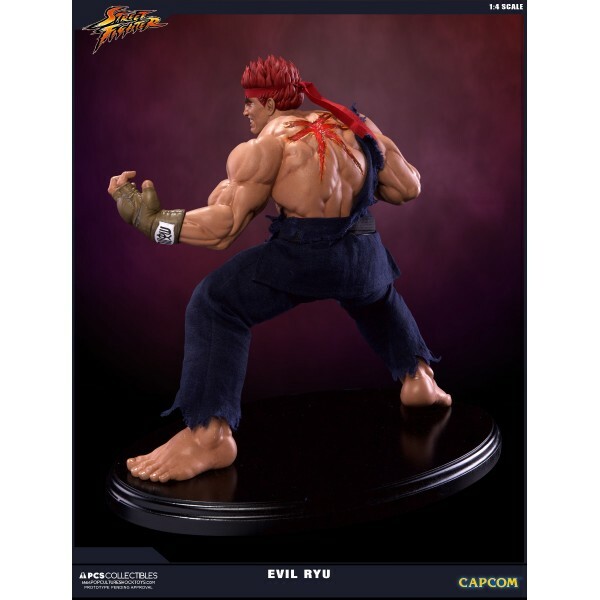 In Story Mode, we’ve seen Ryu flash back to his fateful fight with Sagat; how his “cheap win" still torments him. Eyes literally red with anger, he unleashed a Metsu Shoryuken so devastating it scarred Sagat’s chest. 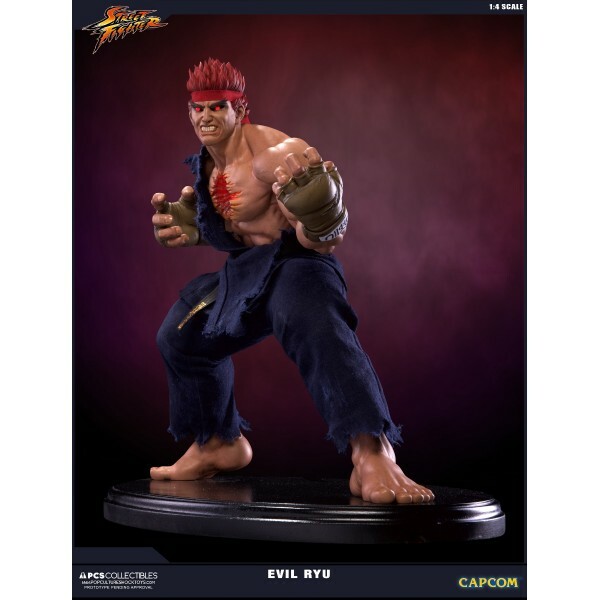 Disfiguring an opponent was anguishing enough, but what truly frightened and shamed Ryu is how much feeling that power…excited him. 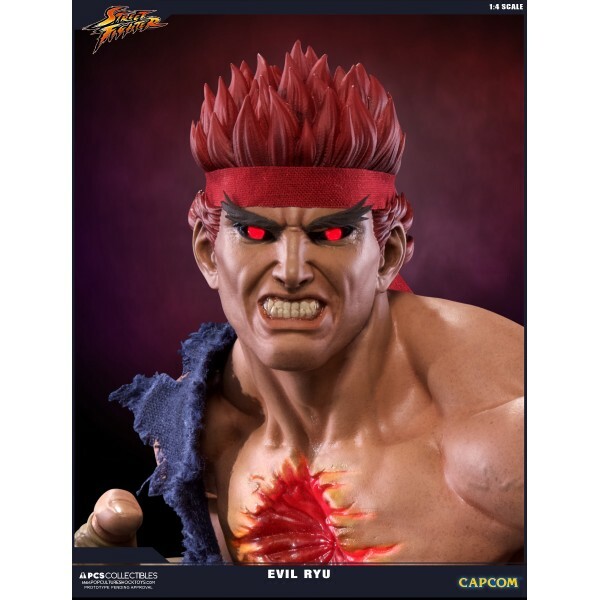 Pop Culture Shock Collectibles is proud to present it’s very first independent 1:4 scale Evil Ryu statue, a unique sculpt created from the actual CG model, and not just a palette swap. Includes - hand crafted polystone figure with cloth tailored costume, LED eyes, chest and back and Certificate of Authenticity.